This latest project, Kitschy Cat’s Alphabet Book, launched itself relentlessly into the midst of my third-novel-of-trilogy writing efforts, (details on the genesis of the idea are on my home page). Unable to put the idea aside, I decided to finish with the Kitschy book before getting back to the mayhem of The Millennium Trilogy. 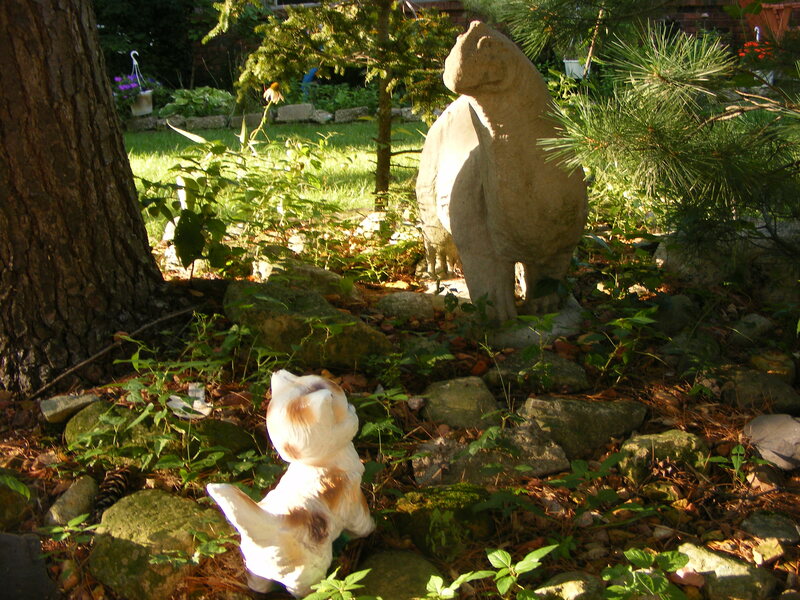 So my husband and I set out, wandering our vast suburb with a digital camera and a concrete cat. Long a fan of alphabet books, I thought that I might be lucky to find a few lawn ornaments to illustrate some letters of the alphabet, which I would then supplement with photos of other outdoor items – plants, perhaps. Lots of plants, lots of letters. I stealthily approach the ornament in its native habitat. Our first subject was a pink concrete pig that I remembered from my runs around the neighborhood, but we had passed only a few houses on our way to see the pig when we were confronted with – a hedgehog! 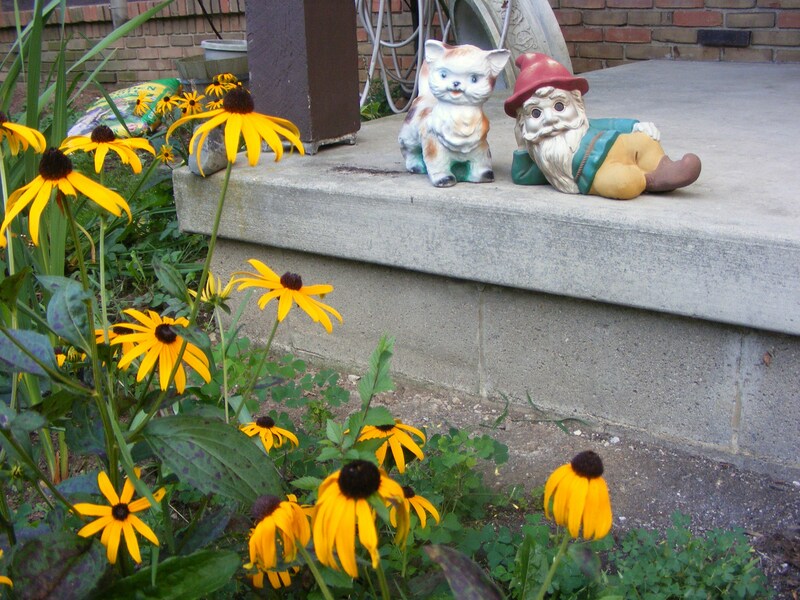 It occupied a flowerbed next to the sidewalk, so it was easy enough to drag Kitschy from her bag and pose her nearby. 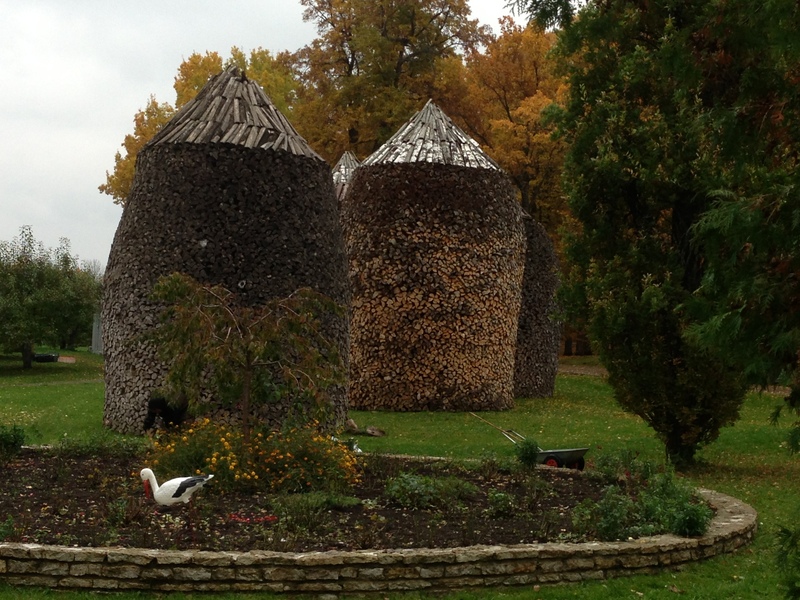 A few more houses and – mushrooms! Shiny ceramic fungi, quite photogenic. Followed by a rabbit! An owl! A demented gnome! 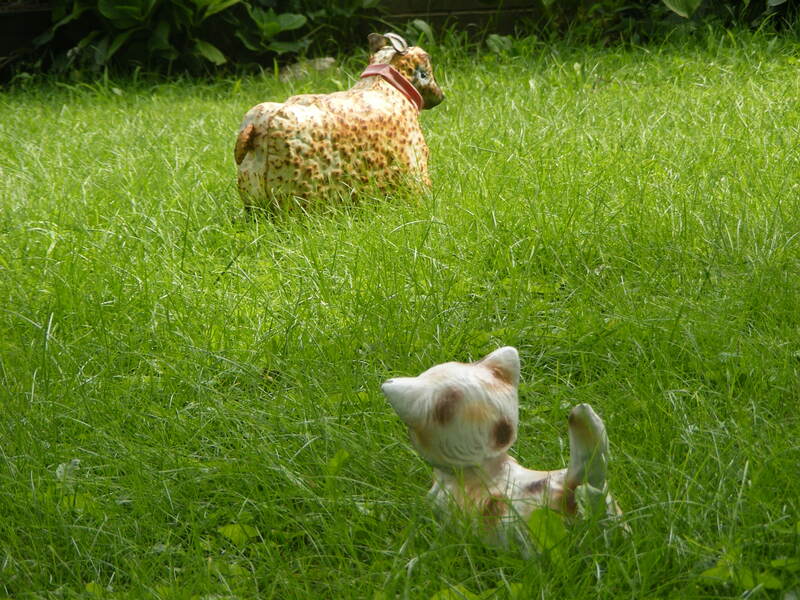 By the time we reached the pig, a theme had emerged for the book: Kitschy posing with fellow lawn ornaments. 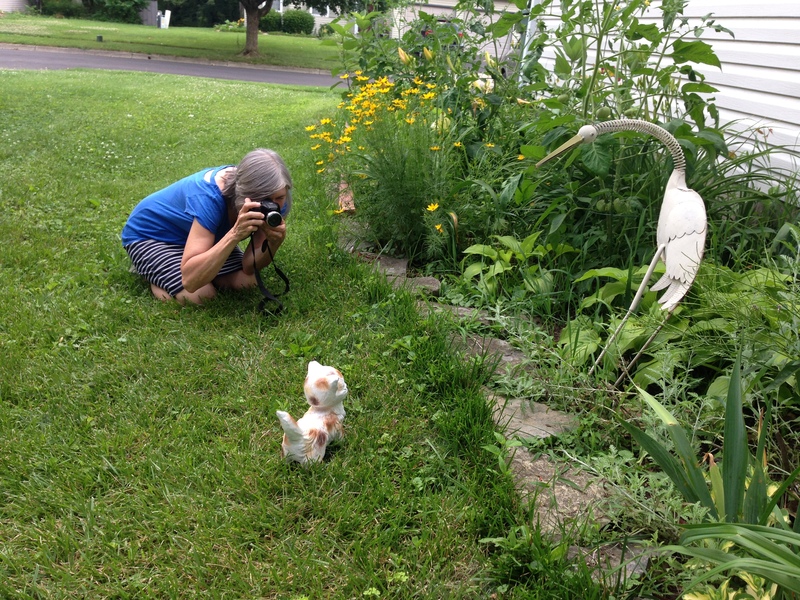 At first we were shy, passing up possible shots because the lawn ornaments were too close to the house, and we didn’t want an irate homeowner to find us mucking about in the flowerbed under his front window. But it seemed a harmless request – “Can I take a photo of your lawn ornament?” – so eventually we knocked and asked, and no one said no. Brontosaurus, Apatosaurus, whatever, from the Lawn Where Any Ornament is Possible. Some lawn ornaments were touching, like the military ones. Others were even kitschier than Kitschy (all those anthropomorphized frogs!) Angels and cherubs were rampant, sometimes accompanied by St. Francis, the Virgin, or Jesus himself. Buddha also made an appearance, tempting me to use him for Z (for Zen!) But this was to be a children’s alphabet book, so I stuck to animal lawn ornaments and was rewarded with a second opportunity for Z – yes, one homeowner had not one, but two zebras. In the end, we found nearly every letter – although I know there must be a unicorn out there somewhere. . .
TO LEAVE A COMMENT, PLEASE SCROLL CLEAR TO THE BOTTOM. THANKS! 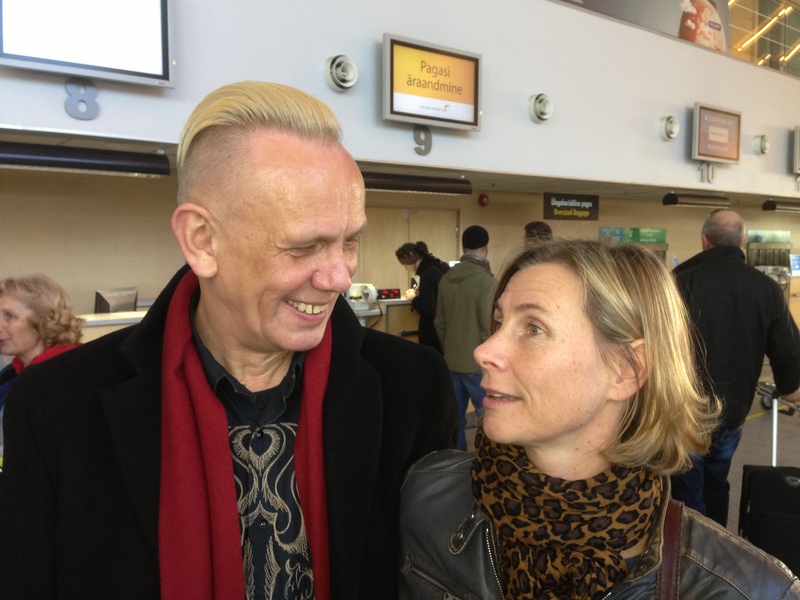 This is Herbert Murd, our friend and contact during the Soviet years, with his wife, Silja. Herbert set up concerts for Living Sound at various churches in Tallinn in 1978-81. As a result, he was imprisoned twice, each time for a period of a year. 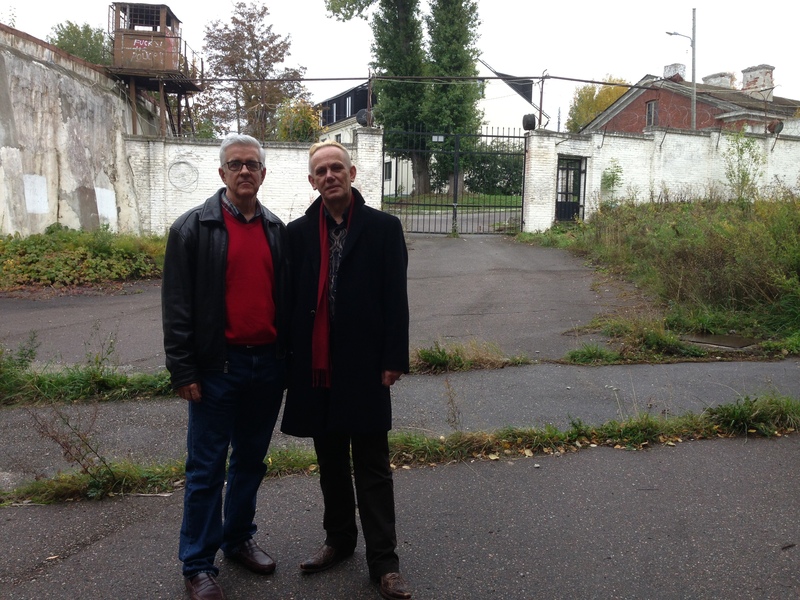 While we were in Tallinn, Herbert took us on a tour of the prison, which began life as a naval fortress built by Czar Alexander II in the 1860s, was a prison under the Soviets, and has been decommissioned since the early 90s. The prison was unheated (not a problem, Herbert said – with 30 prisoners to a cell, it was never too cold). The prisoners exercised for one hour a day by marching around in groups, forbidden to speak, in small, walled, exercise yards. Part of the prison was taken up with offices, where prisoners were frequently taken for interrogation. While they were waiting, they stood in small, unlit closets with the doors closed, one prisoner per closet. After six months at this prison, Herbert spent another six months at a prison camp, which he said was an improvement, since they had more reading material there. Herbert now drives a large, American Lincoln Town Car, which was kind of amusing to us, watching it creep along the narrow, cobbled streets, but it was also gratifying to know that today he is happy and prosperous after enduring what he did under communist rule. Herbert endured and survived and came out victorious. Good for him! TO LEAVE A COMMENT, PLEASE SCROLL CLEAR TO THE BOTTOM – THANKS! Located on the very edge of northeastern Europe, Estonia seems at once Scandinavian in its modernity (officially, it’s a Baltic state, but it reminded me of Sweden and Finland) and central European in its ancient stone fortresses and broad, stone city squares. 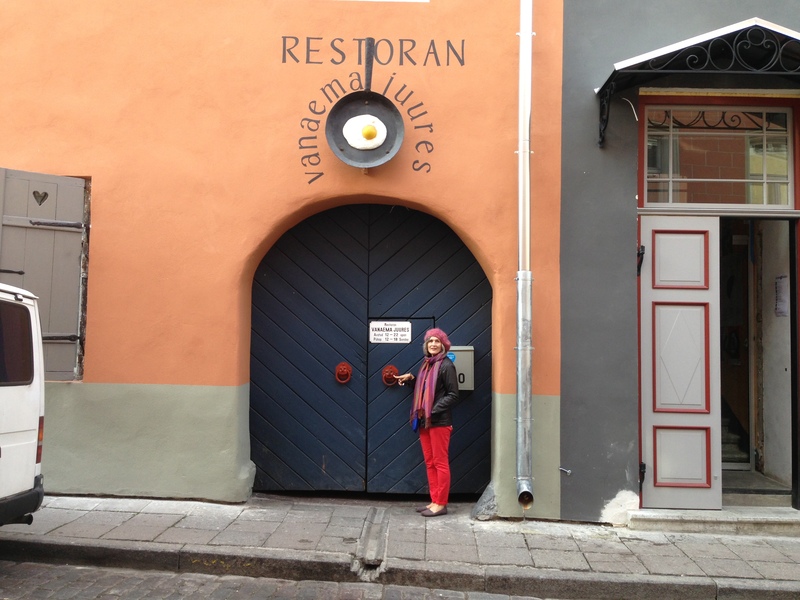 The capital is Tallinn, a beautiful medieval city located on the Gulf of Finland, right across from Helsinki. In fact, ferries go back and forth between the two countries continually. The center of Tallinn is the extremely well-preserved Old City, still surrounded by a wall of defense that visitors and residents can walk along. Tallinn has narrow, cobblestone streets and charming, crooked old buildings and would be a star tourist spot if it were located more centrally. As it is, Finns and Russians are the chief tourists, but there are still plenty of English speakers, as the Estonians are westward-looking and not so fond of the Russians who oppressed them for fifty years. Herbert (and his wife, when she was not working at the conference where Mike spoke) was the model host, driving us all over Estonia, just so we could see what it’s like outside the cities. The countryside is flat and forested with birch (golden and glorious in October) and pines, with well-kept farms scattered around and a population of only 1.3 million, which is unfortunately decreasing because so many young people choose to leave the country to earn a living. 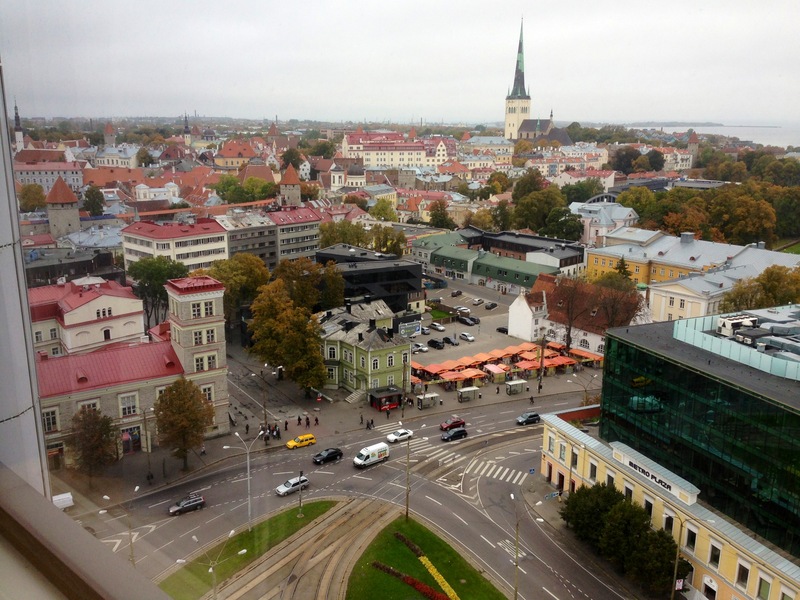 Estonia’s 17,000 plus square miles could be comfortably contained within the borders of Ohio. The eastern part of Estonia, which borders Russia, has more Russians living there than Estonians, which creates tension. These Russians were mostly settled there and in other parts of Estonia after the Soviet Union took control of the country in 194l. The Russian-Estonians would prefer to again be under Russia’s control, which understandably makes the rest of the Estonians nervous, particularly given Russia’s aggression in Ukraine and Georgia. 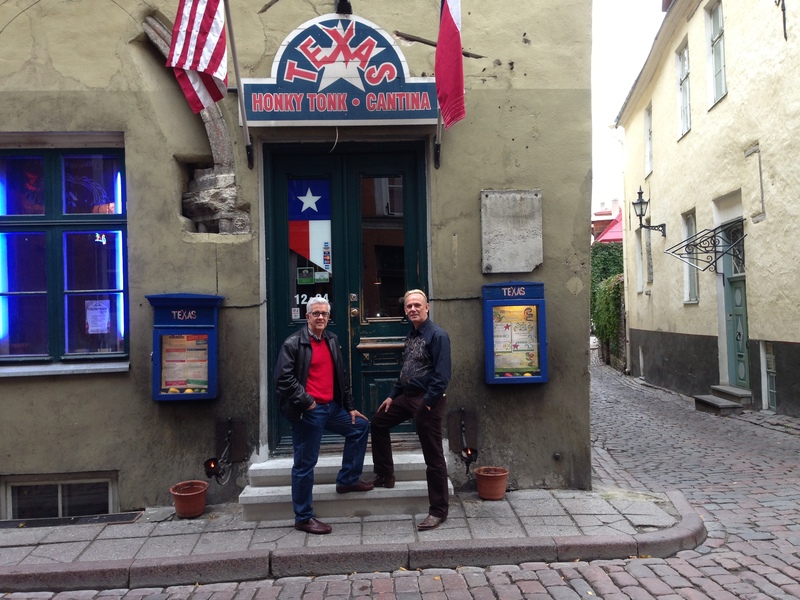 Thirty years ago, Estonia was a satellite of the Soviet Union, and Tallinn, its capital, was one of the places where we gave concerts when we were a part of the gospel singing group Living Sound. In October of last year, we returned (Mike was the featured speaker at a leadership conference) to the scene of the crime, as it were, the Hotel Viru. 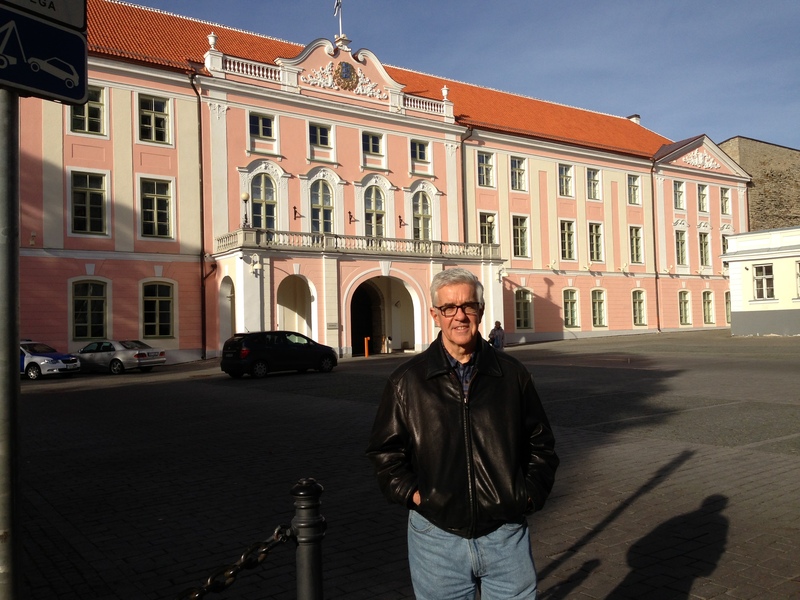 Like all foreign tourists in the Soviet era in Estonia, our group was led around by the official tourist agency Intourist (an arm of the KGB), and housed at the Hotel Viru. We always joked about the microphones in the hotel room walls, but it wasn’t until Mike and I took a tour of the KGB Museum, today actually housed in the Viru, that we realized how accurate our assessment had been. Built in 1972 by a Finnish construction company (the Russians were not up to the task, although the official story was that the “poor Finns” needed jobs, which the Soviet Union kindly supplied), Hotel Viru was the first skyscraper in Estonia, and one of the most prestigious in the U.S.S.R. Its function was to house foreign tourists, whom the Soviets loved for their foreign currency (rubles were a devalued currency) and hated for their spying tendencies. 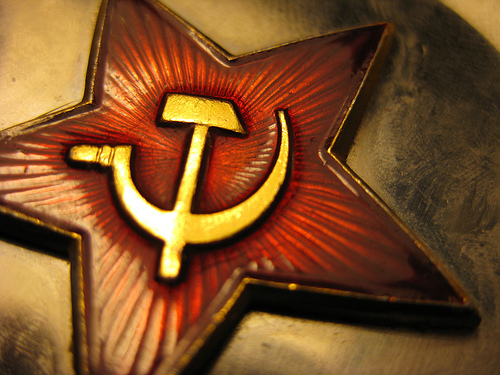 Yes, according to Soviet belief, half of all tourists were capitalist spies. In an effort to better control their 1200 guests, the Viru employed 1800 workers, including a doctor, a dentist, hairdressers, cleaners, maids, kitchen workers (200 of them) – not to mention the old ladies who sat in chairs, one per floor, to record the comings and goings of the guests, and also to offer to buy their Adidas and blue jeans, which fetched a pretty price on the black market. The hotel concierges were ex-military. 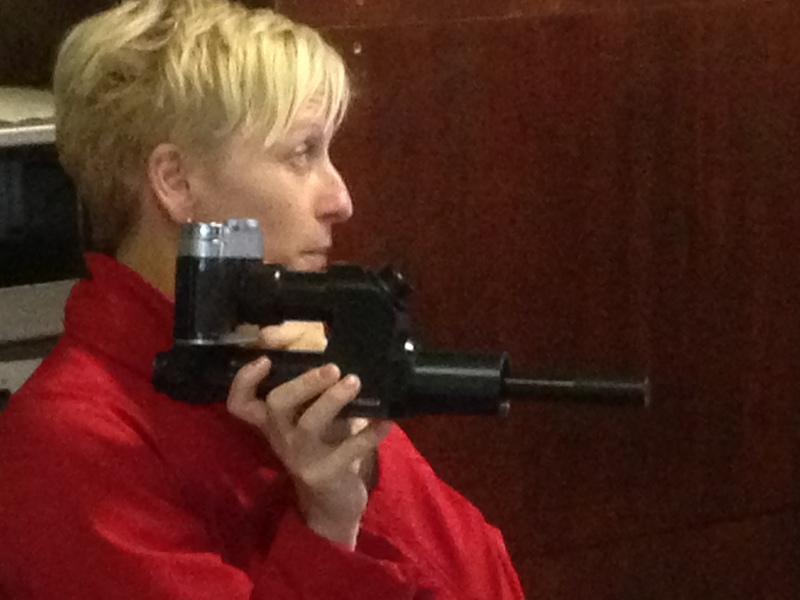 Our museum guide holds a peephole camera – these were embedded in the walls of rooms so the KGB could spy on the hotel guests. The museum tour guide who rattled off all these statistics rode with us on the elevator to the top floor of the Viru, then guided us up the stairs to the actual top floor, which was dedicated to the six or seven KGB agents who worked there. The official story, back in the day, was that the top floor housed “technical rooms”. Instead, this was where the KGB maintained recording devices for eavesdropping on their guests. Sixty of the hotel rooms had microphones hidden in the walls, and particularly dubious guests (which included our group, Living Sound, as well as artists, musicians, politicians, journalists, activists and other suspicious types) were always put in these rooms. Still on the top floor, our little museum tour group stepped out onto the terrace for a stunning view of Tallinn’s medieval Old Town, encircled by high stone wall, the spires of its churches prominent among the ancient buildings. The Soviets considered even the view to be top secret – someone might count the antennas or the ships or the railways – still another reason to block access to the Viru’s top floor. 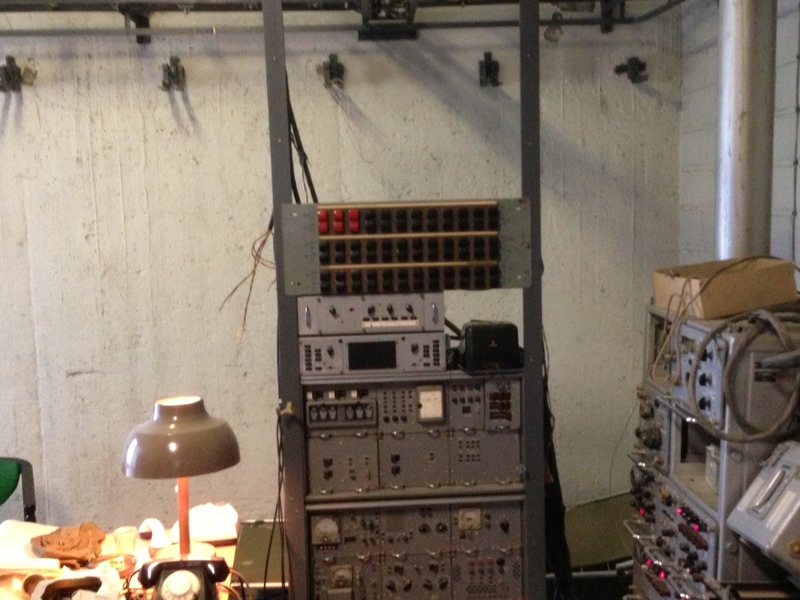 Estonia became independent in 1991 (another fascinating story), and the KGB made a hasty exit, leaving behind outdated recording equipment and the red phone that connected them to KGB headquarters in Tallinn. Hotel Viru was bought by 250 of its workers. Mike hones his spying technique in the former office of the Hotel Viru KGB surveillance floor. 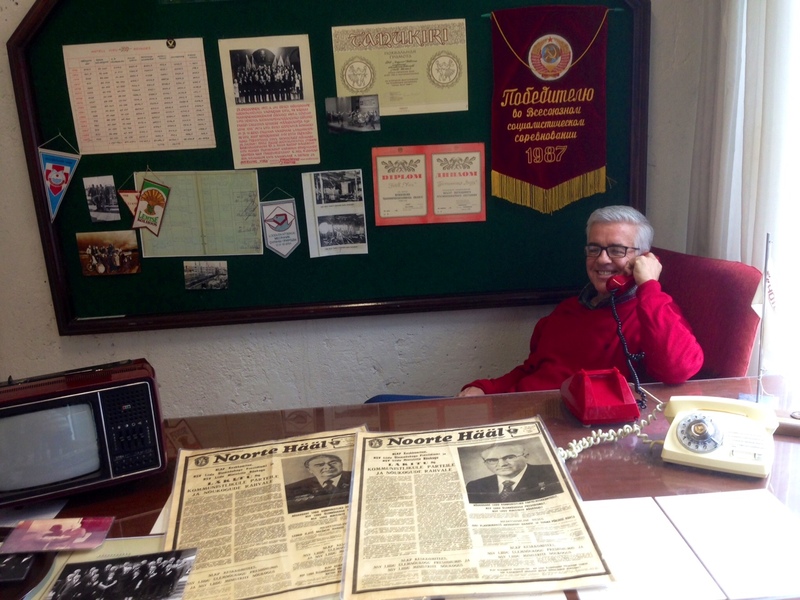 Note the red phone, a direct line to the Tallinn KGB office. It is still the premier hotel, although it no longer spies on its guests, and the KGB Museum is a curiosity of an older time. The Soviet paranoia about foreigners (and, indeed, about their own people) seems almost quaint now, as does the idea of recording idle conversations in hotel rooms. 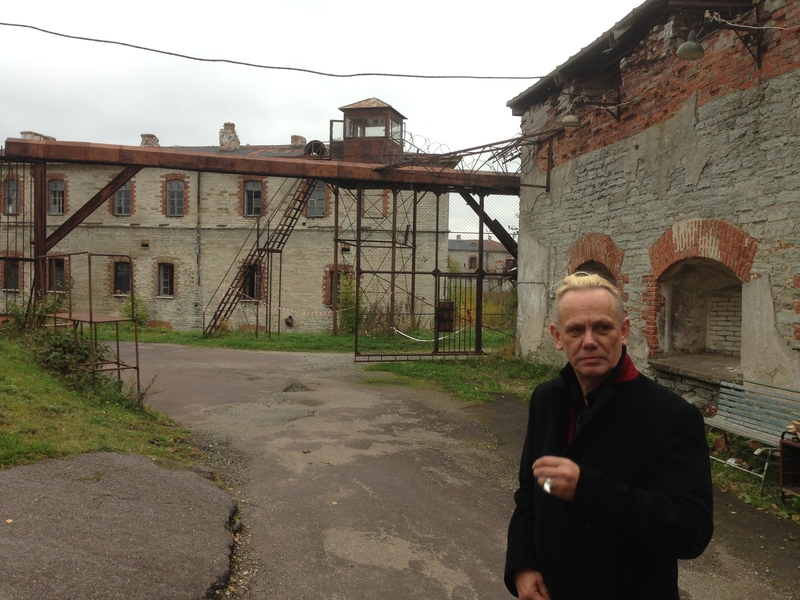 But one of our contacts, an Estonian national, spent two years in prison for working with us, and countless other lives were constricted or destroyed under the Soviet regime. And across the globe, government eavesdropping on its citizens is alive and well – just ask the NSA. I just created this term, which I think would work great in a science fiction tale. So, all you SF writers out there, feel free to borrow. Just credit me in your intro. However, I didn’t invent the term to describe time travel, but to describe the kind of thing that writers sometimes choose to do within the chronologies of their books. 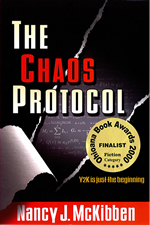 The chronology of The Chaos Protocol was easy: a countdown from June 10, 1999 to January 1st, 2000. In Book Two, Blood on Ice, events depended on one of the character’s being released from prison. When I checked out likely times of trials and appeals and so on, three years from his arrest (2003) turned out to be a reasonable time for him to be pardoned, and a reasonable place for Blood on Ice to begin. Now comes book three of a trilogy that I hadn’t really planned to write. 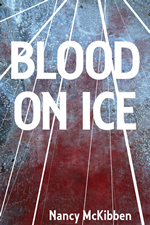 I published Blood on Ice in 2012, but I had written it in real time, more or less, which was from 2000-2003. The book takes place in 2003-2004. Since the third book follows immediately from the first, it should start in 2004. Here’s where I begin to waffle. It is 2013, and I’m writing a book that takes place in 2004. But that’s awkward. I have to keep fact-checking. I have to remember what was invented when. Technology has accelerated in the years since I wrote TCP, when I felt that I needed to explain what email was and how it works. I actually removed that part of the book when I made it an ebook, as it now seems too obvious. When I published TCP, there were no ebooks. If the time is 2004 in the book, as it should be, then it’s before iPhones. It’s before social networking, or just at its beginnings. But suppose I want to use social media as part of my plot. What to do? The answer: waffle. Waffle with time, specifically. Write the book as if it is taking place today, without aging the characters and without worrying too much about which technology has been invented. Because at the rate at which technology now changes, every book is dated anyway a year after the virtual ink virtually dries on the virtual page. 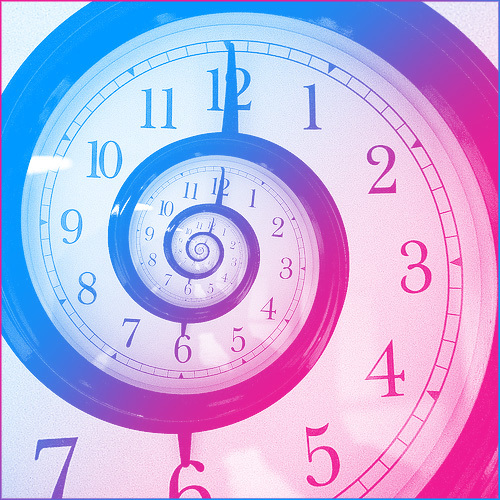 So, instead of author error or ineptitude, time waffling is just the writer’s choice – poetic license, as it were – to treat time a little more flexibly than happens in real life. Fiction is not real life, but an alternative reality in which you, the reader, willingly suspend your disbelief, right? So please suspend it just a little bit more for Book 3, which as yet has no title – I promise it will be worth your while. In the distant past, in a galaxy far, far away – well, actually it was when my husband and I lived in England, working in the office for Living Sound, a Gospel band we had previously toured with for three years (Mike on trombone and me on typewriter.) We toured Asia, the U.S., and Europe, both East and West. 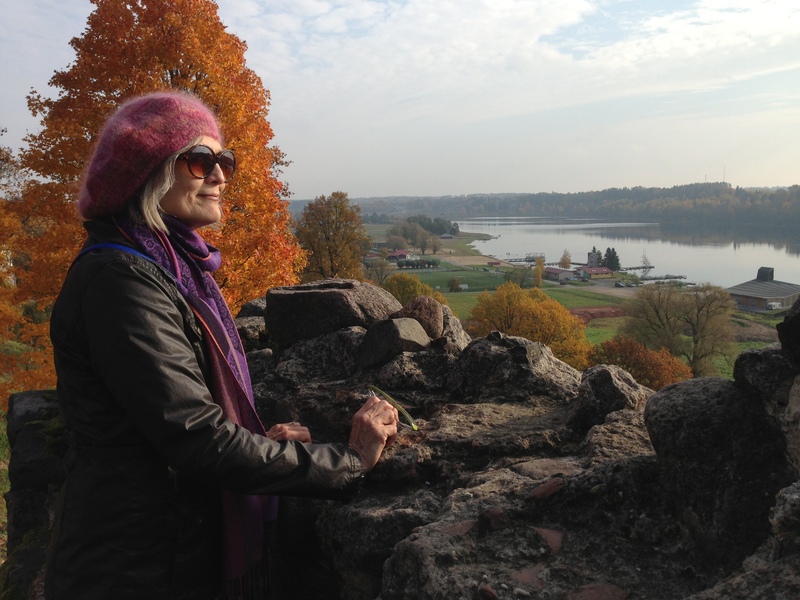 In a complicated series of events that can wait for another time to tell, Mike became acquainted with Alexandra Pakhmutova, a renowned Soviet composer, who asked if Living Sound would sing and record some of her music in English. Later we learned that she intended to use the songs in her role as the official composer of the 1980 Summer Olympics. Yes, these were the Jimmy Carter years. So although the U.S. athletes did not make it to the Olympics, there was an American Gospel group singing on the official Soviet Olympic film. My part in all this was to write the lyrics in English. In those days, a dark image. To this end, I tracked down a little old Russian lady in Bristol (we were living in Malmesbury, Wiltshire at the time) and she agreed to translate Pakhmutova’s lyrics in exchange for an album by a Soviet opera singer (which I bought for her in Moscow on a subsequent trip.) It then fell to me to take the literal translation of the lyrics and make pop lyrics that rhymed and made sense, while Don Moen, our arranger back in the States, would do the arranging. I was pregnant at the time with our first child (hugely so), but it was a pleasant diversion to do scansion and rhyme for a bunch of Soviet pop songs. I believe that I wrote the lyrics for about ten songs, but only two or three were finally chosen to record. And now we have recordings of these oldies but goodies. (Think disco.) The first is We Can’t Live Without Each Other, Pakhmutova’s greatest hit. The second commemorates Yuri Gagarin’s flight into space as the first cosmonaut (remember, these were Soviet times, rife with propaganda.) It’s called Childhood Dreams (literal translation: I Dreamed of Achievement Since Childhood, a nice Soviet title.) Both songs come to us today courtesy of Carlo Einarsson, a former keyboard player for Living Sound, now a marketing guy in Sweden. Enjoy the nostalgia, and marvel at how Russian/U.S. relations have changed since those days. I began thinking about cranberry sauce while researching web content for a client (I freelance when I am not writing novels). Thoughts of cranberries led to thoughts of cranberry sauce, which led to thoughts of what used to pass as cranberry sauce when I was a child. So here we are. Those of us who grew up in the 50s recall the cranberry as a sad little fellow whose fate it was to be absorbed into the cranberry sauce collective. 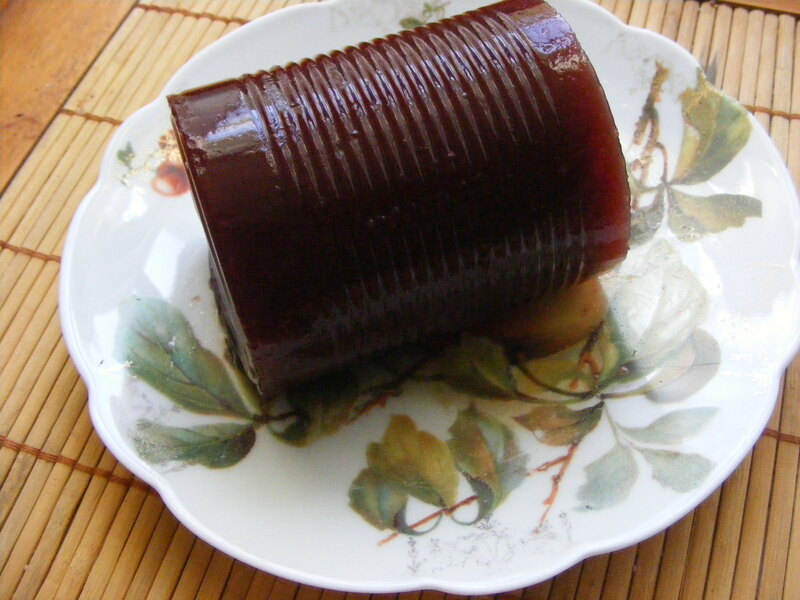 Crushed, jellied, and canned with its comrades, it then turned up on our holiday plates in roseate disks that tended to melt, uneaten, into our mashed potatoes – because really, canned cranberry sauce didn’t taste very good. In fact, the cranberry of the l950s, amalgamated into an unrecognizable mass of quivering burgundy, makes a poignant social commentary on the drive toward conformity so characteristic of that era. 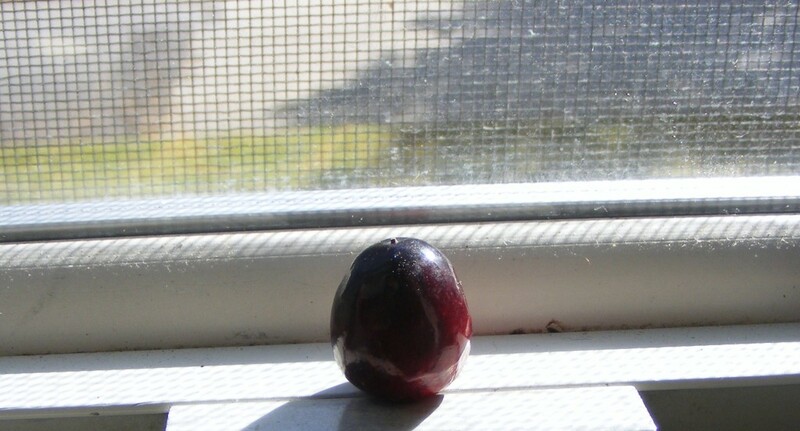 Today the cranberry has been rehabilitated, and people once more recognize it as an independent fruit. Cranberries turn up whole in sauces and relishes, baked in quick breads and cakes, and dried on the grocery shelf next to the raisins. I would venture to say that craisins, those ruby gems of the dried fruit world, are the new raisin. After all, raisins in an oatmeal cookie or a grain salad may taste delicious, but they suffer from an unfortunate resemblance to dead flies. Not an attractive trait in a food. Time to insert a recipe to prove my point. This beauty is a cranberry upside down cake, courtesy of Martha Stewart. Because we are mostly plant people these days, I substituted olive oil for butter and soy and almond milks for whole milk, and the recipe did not appear to suffer. I did use an actual egg (from a healthy, active, free range chicken! ), but I assume a substitute would work. 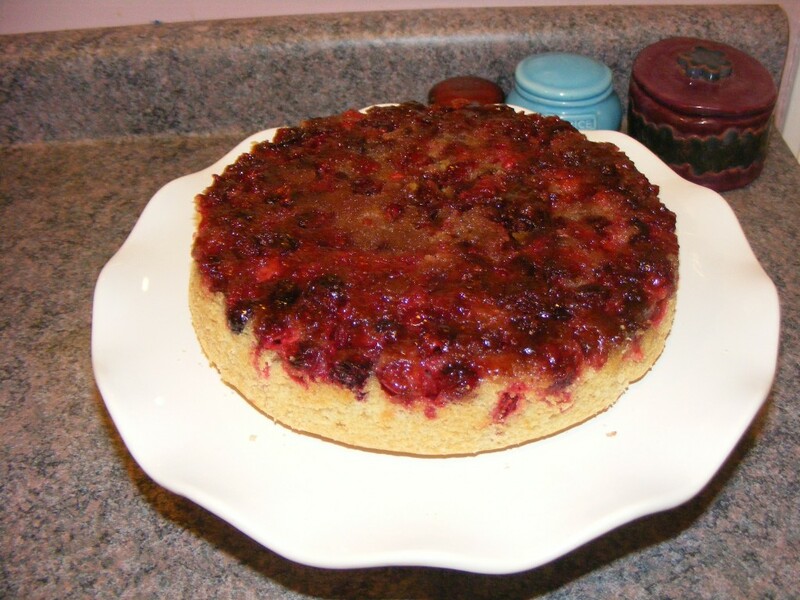 Further disclosure: Cranberries are tart, and as pretty as this cake looks, I don’t think I would bake it again, unless I replaced some of the cranberries with something sweeter, like raspberries. Preheat oven to 350 degrees with rack in center. Rub the bottom and sides of an 8-inch round cake pan with 2 tablespoons butter. In a small bowl, whisk together 1/2 cup sugar with the cinnamon and allspice. Sprinkle mixture evenly over bottom of pan; arrange cranberries in a single layer on top. With an electric mixer, cream remaining 6 tablespoons butter and 1/2 cup sugar until light and fluffy. Add egg and vanilla; beat until well combined. In another bowl, whisk together flour, baking powder, and salt. With mixer on low speed, add flour mixture to butter mixture in three batches, alternating with the milk, until well combined. Spoon batter over cranberries in pan, and smooth top. Place pan on a baking sheet; bake cake until a toothpick inserted in the center comes out clean, 30 to 35 minutes. Let cool on a wire rack for 20 minutes. Run a knife around edge of cake; invert onto a rimmed platter.